Lady Gail Carriger Launches her first Hardcover adult series, Prudence, at Mysterious Galaxy in San Diego 03/17/15. 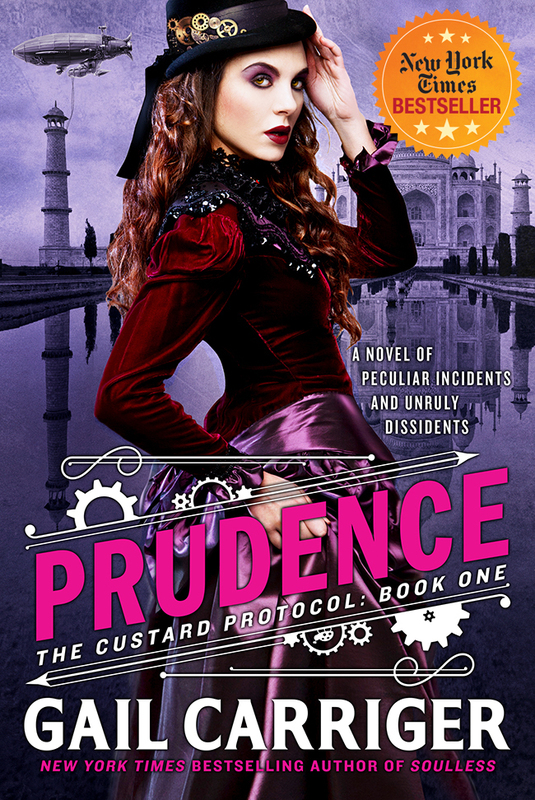 Introducing the Custard Protocol series, in which Prudence travels to India for Queen, country…and the perfect pot of tea. When Prudence Alessandra Maccon Akeldama (“Rue” to her friends) is bequeathed an unexpected dirigible, she does what any sensible female under similar circumstances would do – she christens it the Spotted Custard and floats off to India. Soon, she stumbles upon a plot involving local dissidents, a kidnapped brigadier’s wife, and some awfully familiar Scottish werewolves. Faced with a dire crisis (and an embarrassing lack of bloomers), Rue must rely on her good breeding – and her metanatural abilities – to get to the bottom of it all. This is the exciting next generation spin-off series from the Parasol Protectorate books, but it is not necessary to have read those first. Gail’s articles, thoughts, and tidbits on Prudence. Prudence was a New York Times and USA Today bestseller, an Amazon Best Book Pick in Romance and Sci-Fi/Fantasy categories, and Library Reads pick.